PhoneWorld team has tried to study the various packages available in the market by all the five mobile operators and tried to make a comparison of these tariffs in a simple format that can be understood by not only a retailer but ordinary consumer. Please note that the comparison is done by interpolating call rates to a standard flat rate of per min call. The day and night offers slab rates have not been included in this comparison along with other perks offered by different operators. For detail view on your required selected package please visit their respective website before finalizing your decision. 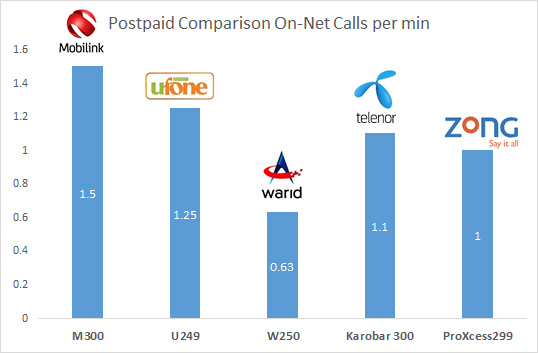 Lowest On-net Calls Per Min from the packages available that are provided by the operators on their web site, Warid’s Glow 2 has the lowest on-net tariff followed by Telenor Talkshowk A1, whereas Ufone 30 Sec has the highest on-net tariff with Mobilink Jazz and Zong closely following as number 2 & 3 respectively. The difference is quite substantial of almost 40% between the highest and the lowest packages being offered by Ufone & Warid respectively. 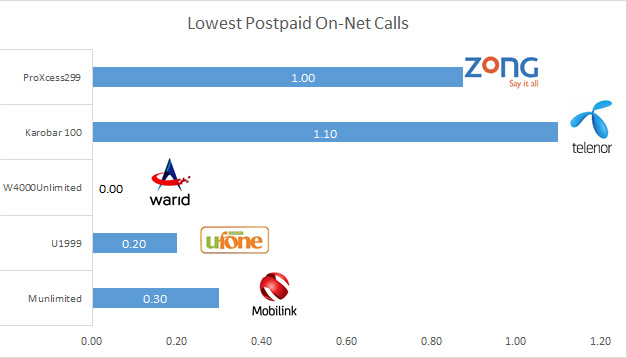 Warid’s Glow 2 again has the lowest off-net tariff followed by Telenor Dejuice and Zong 45, whereas Jazz First has the highest off-net tariff with Ufone 30 Sec closely following as number 2. 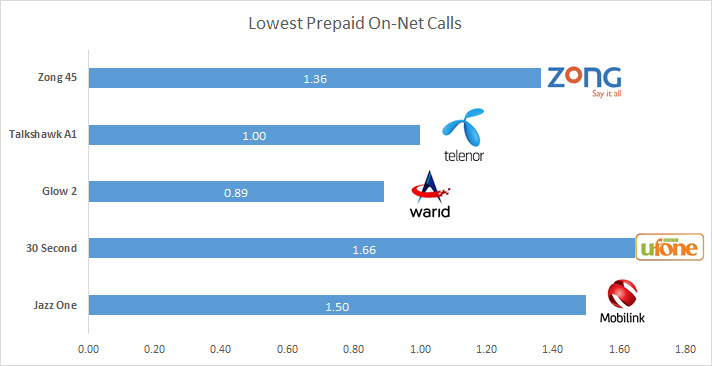 The difference is again quite substantial of almost more than 50% between the highest and the lowest packages being offered by Mobilink & Warid respectively. The values calculated here are done according to flat call rate per min, i.e. it may seem that Ufone 30Second package is expensive but the actual billing is Rs.0.83 / 30 Seconds. Similar is the case with Zong 45 whose billing is Rs0.45 / 20 Seconds. Warid’s W4000 has zero tariff for On-net calls. 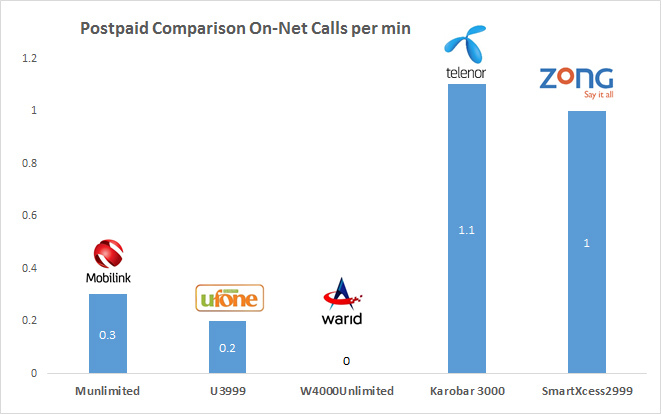 The 02nd and 3rd lowest tariff are from Ufone U1999 and Mobilink Munlimited. 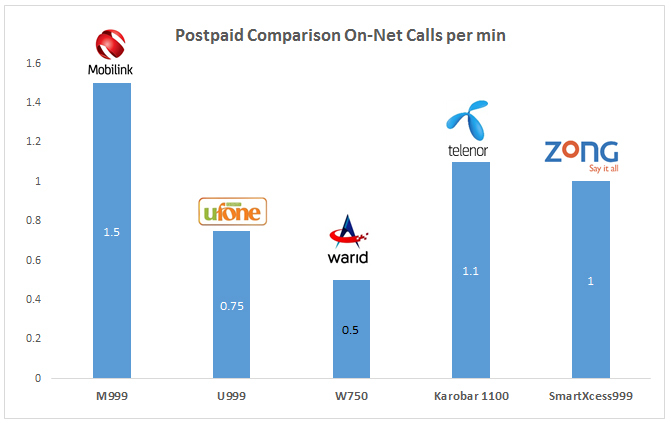 Whereas as, Telenor Karobar 100 and Zong’s has the highest and 02nd highest tarrif for On-Net calls in the lowest Postpaid category. 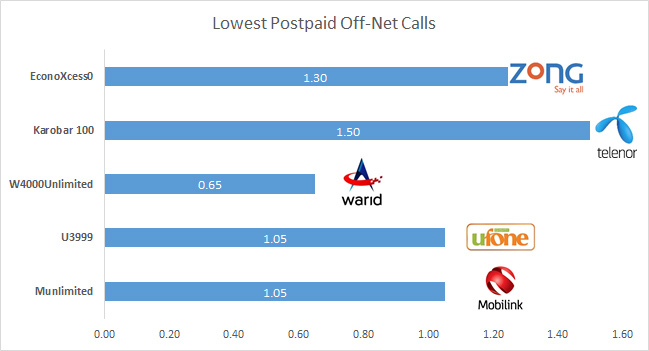 The highest postpaid tariff for the lowest on net call is around 1.1 Rs/min. However, the it is important to note that Warid has Rs. 4000 fixed fee/month to avail this package whereas Ufone has Rs. 1999/month fixed charges for the tariff shown. The consumer needs to check his consumption for availaing the best possible package across operators. The values calculated here are done according to flat call rate per min, i.e. it may seem that that Warid W4000Unlimited is better than the rest but you will have to pay 4000 per month in advance whether you use this facility or not, while other operator packages; for instance for Telenor Karobar 100 we will be paying only 100 per month in advance. In addition to this there are other factors to look into such as free voice minutes, free sms, internet data package, etc. Please visit respective website for details. 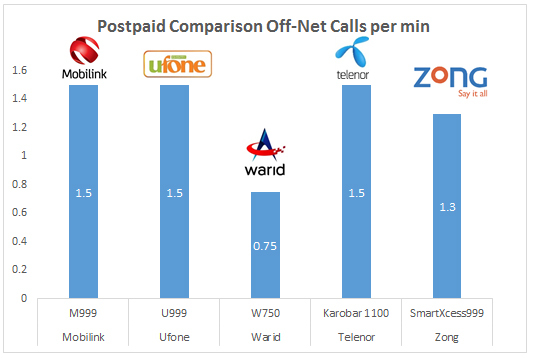 Warid’s W4000 with 0.62/min is the lowest tariff for Off-net calls. The 02nd and 3rd lowest tariff are from Ufone U3999 and Mobilink Munlimited. 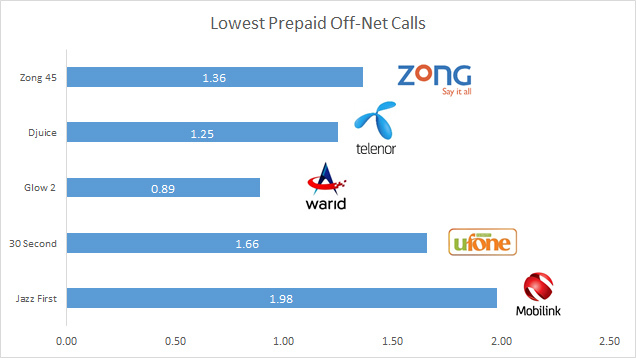 Whereas as, Telenor Karobar 100 and Zong’s EconoXcess0 has the highest and 02nd highest tarrif for Off Net calls in the lowest Postpaid category. The highest postpaid tariff for the lowest off net call is around 1.5 Rs/min. 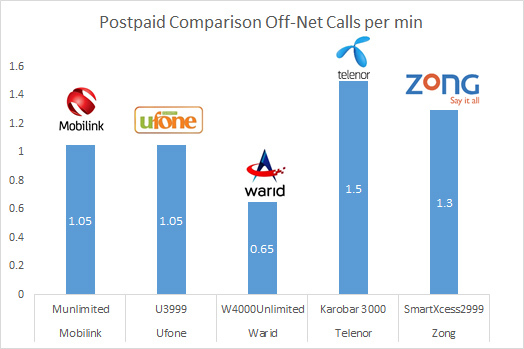 The graph below facilitates the end user in choosing a suitable postpaid plan in accordance to On-Net calls i.e. if most of the usage is within the same network. 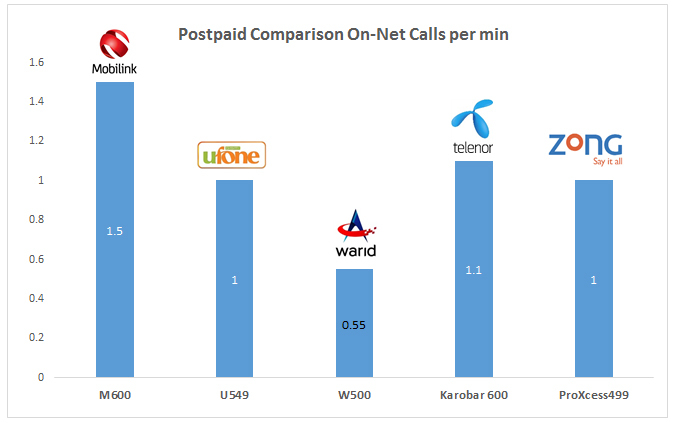 The chart shows how much a call cost per minute within the same network across different operators in their respective postpaid package. This might help the end user to choose an operator and under that a package suitable enough within a specific price range. The following graph for consumers with Rs. 300 and Rs.600 price range. For other price bracket it may vary, please visit our web site for the other price brackets. Warid’s W250 has the lowest On-net tariff of Rs. 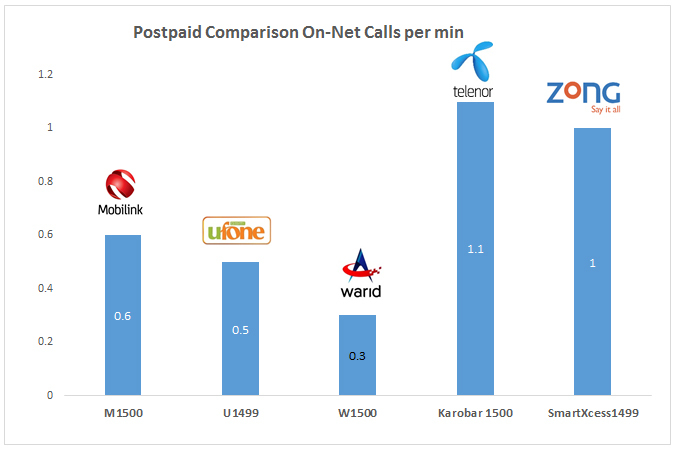 0.6/min with 02nd and 3rd lowest tariff from Zong ProXcess299 and Telenor Karobar 300. 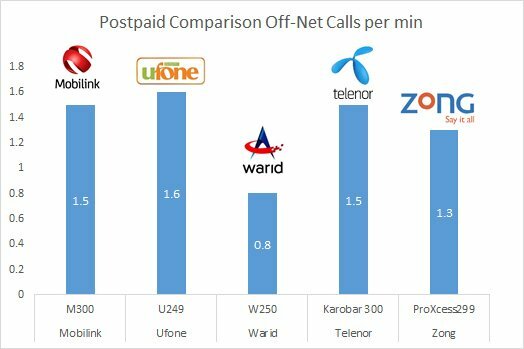 Whereas as, Mobilink M300 and Ufone U249 has the highest and 02nd highest tarrif respectively for On-Net calls in this price bracket. The highest postpaid tariff for this slab is around 1.5 Rs/min. The values calculated here are done according to flat call rate per min, i.e. it may seem that that Warid W250 is better than the rest but in addition to this there are other factors to look into such as free voice minutes, free sms, internet data package, etc. Please visit respective website for details. The graph below facilitates the end user in choosing a suitable postpaid plan in accordance to Off-Net calls i.e. if most of the usage is outside the network. 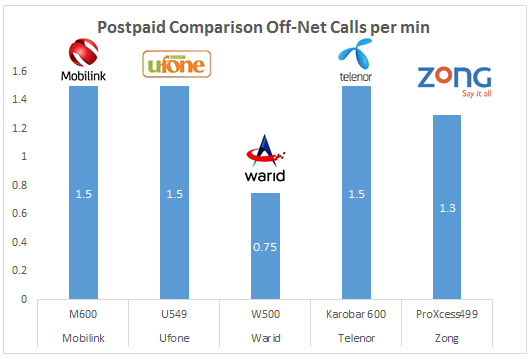 The chart shows how much a call cost per minute across different operators in their respective postpaid package. This might help the end user to choose an operator and under that a package suitable enough within a specific price range. The following graph is again for consumers with Rs. 300 and Rs.600 price range. For other price bracket it may vary, please visit our web site for the other price brackets. Warid’s W250 has the lowest Off-net tariff of Rs. 0.8/min with 02nd from Zong ProXcess299 and 3rd lowest tariff from both Telenor Karobar 300 and Mobilink M300 which are equal. 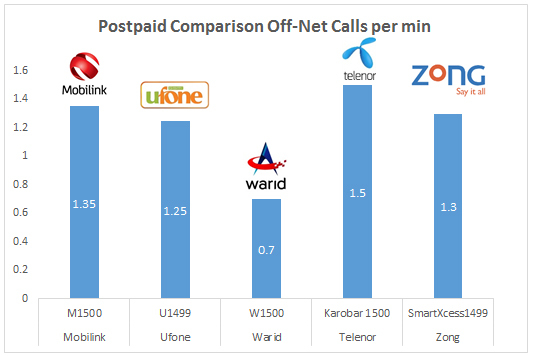 Ufone U249 has the highest tarrif for Off-Net calls in this price bracket. The highest postpaid tariff for this slab is around 1.6 Rs/min.